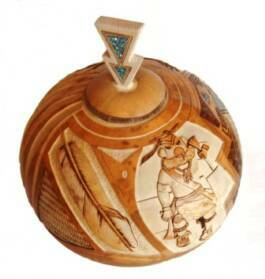 Here are a few photos showing some of my gourds in progress, so you can see what they look like along the way. 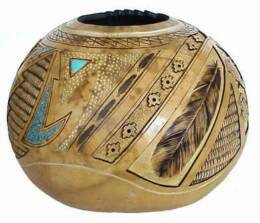 I try to find thick gourds so I can add lots of depth and detail to the carved areas. 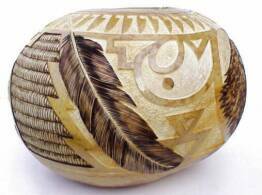 I use a a micro carver to do the carving. 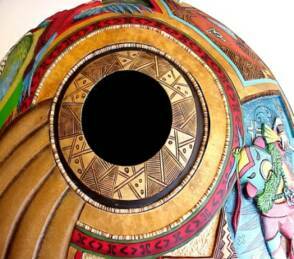 You can see the lighter areas where the outer layer has been carved away. 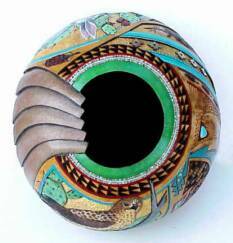 Inlace (a stone and resin mixture) was added to some of the recessed areas. 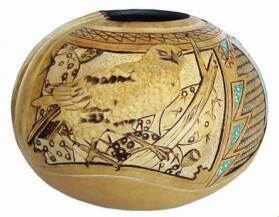 I woodburned some areas and painted the rest of the designs with acrylics. 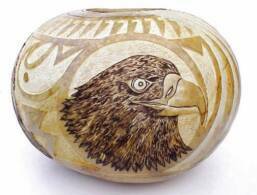 This gourd won 1st place in the Advanced Carving Division of the 2003 California Gourd Society Competition, and was also awarded Best of Show. 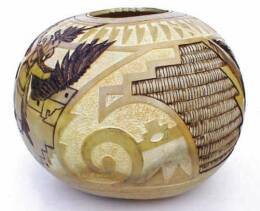 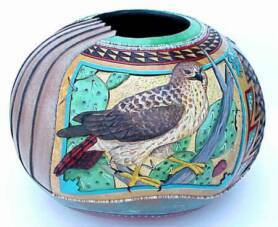 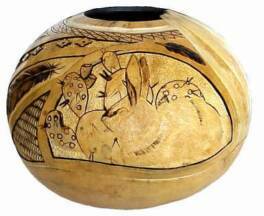 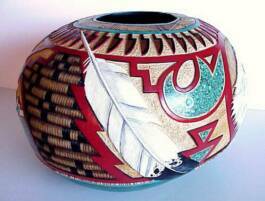 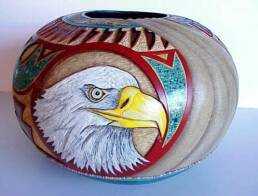 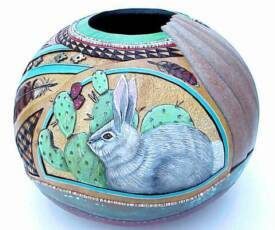 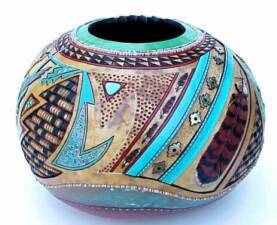 The gourd features a Red-Tailed Hawk and a desert cottontail rabbit. 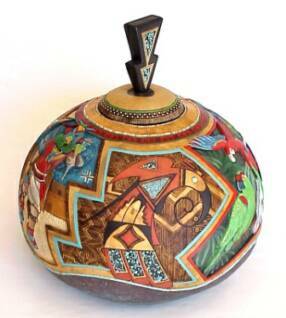 It has lots of carving and inlaid areas. 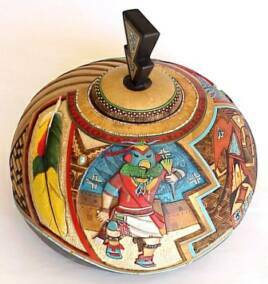 Some woodburning was added before painting the gourd with acrylics. 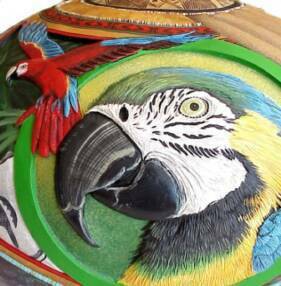 The gourd features different types of parrots and macaws, including the Thick-Billed Parrot which was indigenous to the Southwest but is rarely seen today outside of Mexico. 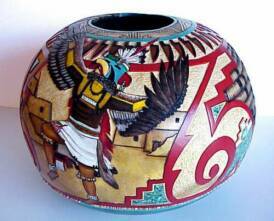 The feathers of parrots were prized in ancient times and are still important to Native cultures of the southwest. 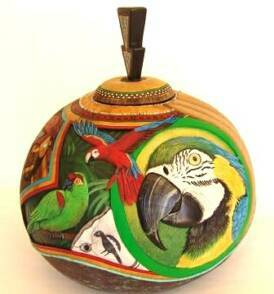 One section of the gourd has a stylized bird design, another shows the "Kyash" or Parrot katsina. 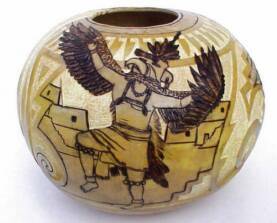 A single colorful wing feather is carved in relief, and another section has a Mimbres pottery sherd with a parrot design. 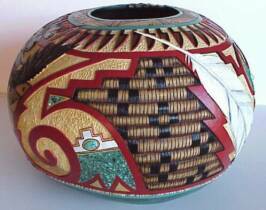 A stylized Hopi sash encircles the top along with voluta shell heishi inlay. 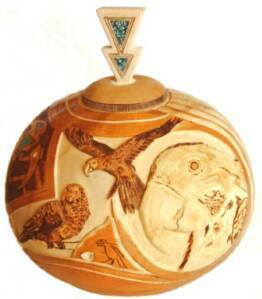 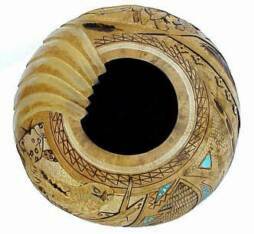 Stone and resin inlays were added to the gourd and the lid. 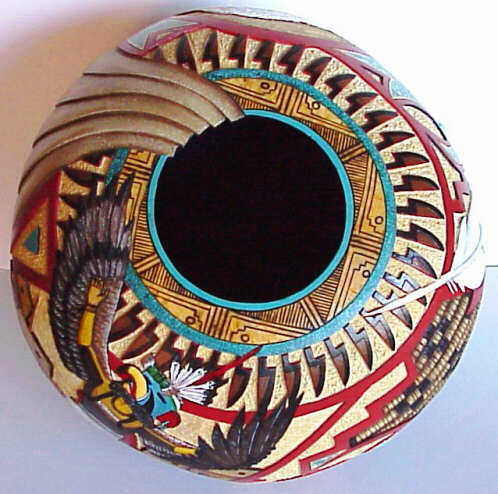 The lid can be removed to reveal the burned geometric design around the rim. 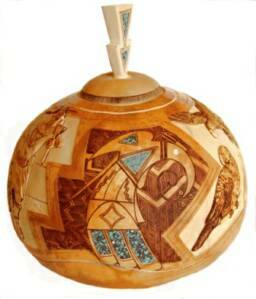 Detail of opening with lid removed.